On Saturday, October 27, 2018, the Ms. Senior Guilford County Pageant crowned the county’s fifth senior queen. Sherry Pinedo of Oak Ridge was honored with the crown and title of Ms. Senior Guilford County 2018. If she chooses, Pinedo can compete in the 2019 North Carolina State Pageant in Southern Pines on May 18, 2019. Janet Wagner of High Point was chosen first runner-up and Melba Eldridge-Lewis was second runner-up. The candidates had a five-minute interview with the judges, Mary Riddell, singer/entertainer; Tiffany Rush, Miss Randolph County 2018; and Joelle Begic, director of the Senior Center, Senior Services of Guilford. The candidates were also judged on their “I Believe” statement, evening gown, and talent. Hostess and sponsor for this event was Spring Arbor of Greensboro. Master of ceremonies was WTOB’s Mark Lundy. David Beck provided music and entertainment was provided by Frann Griffin, Ms. N.C. Senior America 2018. More than 50 people attended the crowning event. 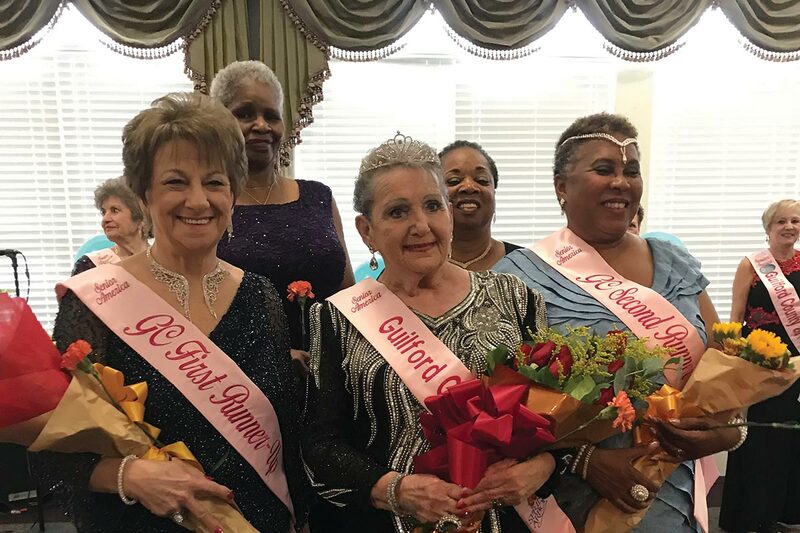 The goal of the Ms. Senior Guilford County Pageant is to enhance the image of women who have reached the “Age of Perfection”—60 years or better—and seeks to honor women who display dignity, maturity, and inner beauty. To become a candidate or to co-sponsor the 2019 Ms. Senior Guilford County Pageant, contact Sarah Daffron at sdaffron@triad.rr.com.